Watching a skilled conversion optimizer work is a sight to behold. These people — the good ones — are wizards. They know exactly what to do, where to move stuff, how to organize it, how big to make it, and exactly how to design a page that will earn floods of conversions and loads of cash. Conversion optimization, part mystical art and part entrancing science, is not something that comes naturally. The best conversion optimizers have analyzed thousands of landing pages, spent a long time on boring split test results, and have developed the ability to read the minds of their customers. In addition to my experience in conversion optimization, I’ve had the privilege of working with some of the world’s most successful conversion optimizers. What I’ve produced in this article is an unveiling of how the best conversion optimizers create landing pages. For many businesses, the process of creating landing pages is a templated task. Rather than develop unique landing pages for different PPC ads or campaigns, the designers merely swap out a few content pieces in a template and produce a new landing page. Unfortunately, that’s not a very strategic method. A landing page, whether that landing page is also the website’s homepage or a PPC target, is a conversion powerhouse. Allowing its fate to be determined by the efficacy of a templated design is risky at best. All of the features of a landing page matter. The elements of “content” that I will reference below include more than just words or CTA copy. They include the whole approach of a landing page — its purpose, intent, audience, action, and then the obvious things like images and text blocks. A word of warning: Conversion optimization isn’t as simple as following a few “best practices,” reducing your form fields, or making your CTA button bigger. Sure, those things help. But it’s more than that — more complicated and far deeper. What you’re about to read simplifies it, but doesn’t change the fact that there is a level of complexity that goes beyond what you may be expecting. I sweep aside all the customary babble about orange buttons and things that always boost conversions. Instead, I’ve gone straight for the cognitive jugular. 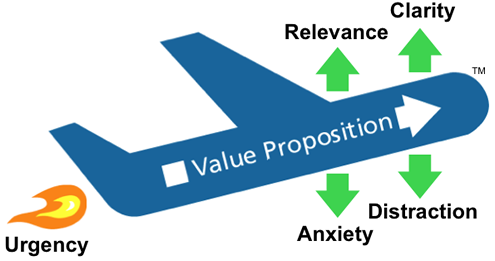 This is the deep stuff that really matters in conversion optimization. This is how the pros create landing pages. This single point trumps every other point in the history of conversion optimization. Knowing your target customer is the single most important thing you can do as you create your landing page. Because your target customer is the one who will be converting. Make it for that person, not for anyone else. Every group of buyers is different. What works for cat lovers is not going to have the same impact on marketing professionals. Every element on a landing page needs to meet the unique needs of the target audience — images, copy, explanation, etc. People have different learning styles. An explainer video may work for some people, while long-form content may work for another type of learner. The more targeted the landing page, the more effective it will be. I suggest a laser-focused approach to understanding your customers. Before you run a single test, create a single headline, or look for a single image, do this: Research and know your customers. Nothing matters unless you know your customers. First, I suggest that you develop a customer persona. You can use the list in my Online Marketing guidebook to help you. Second, create a customer journey map to help you understand how and where your marketing intersects with the customer’s experience. Notice how some of the most successful landing pages have an unstoppable focus on the target audience. Here’s ManPacks. A landing page with this type of headline, subheadline, and picture would work with few other audiences. Compare that with a landing page that targets a completely different demographic. Everything about these landing pages is different. 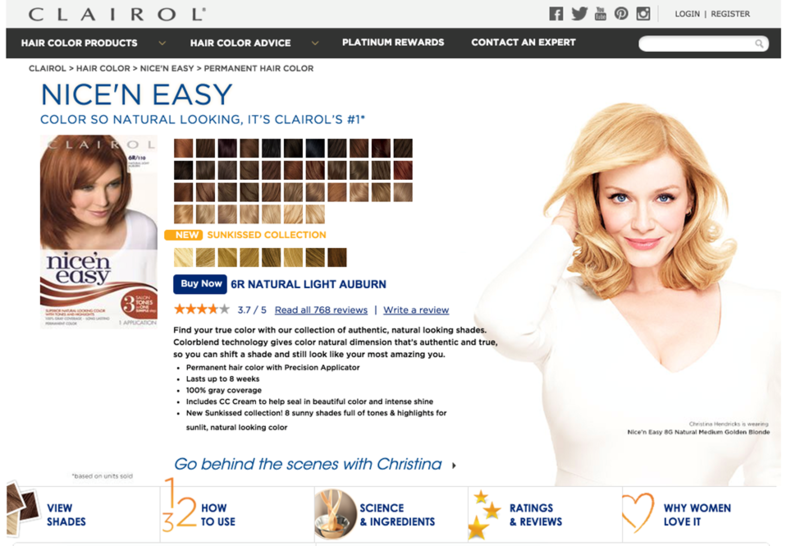 The conversion action, the layout, the copy, the options, the images — everything is different. Because the two pages have two distinct audiences. If you learn your customers, then the rest of the conversion optimization process is possible. Don’t even attempt to do conversion optimization unless you know your customers. Understand the right conversion action. Before we can have a coherent discussion about conversion optimization, we need to understand what the conversion action is. What do I mean by conversion action? Every landing page has a certain action that it is trying to get the customer to do. When the customer completes that action, it is known as a conversion. Conversions may be a purchase, or they can be a micro-conversion such as filling out a form or submitting an email address. The conversion action is very important to the conversion potential of the page. For example, a conversion action to “buy now” may not be the right one for a landing page. Instead, a conversion action of “free trial” may be better. This has to do with more than just CTA copy. It has to do with the overall focus of the page as a whole. There are huge differences in landing page conversion actions. 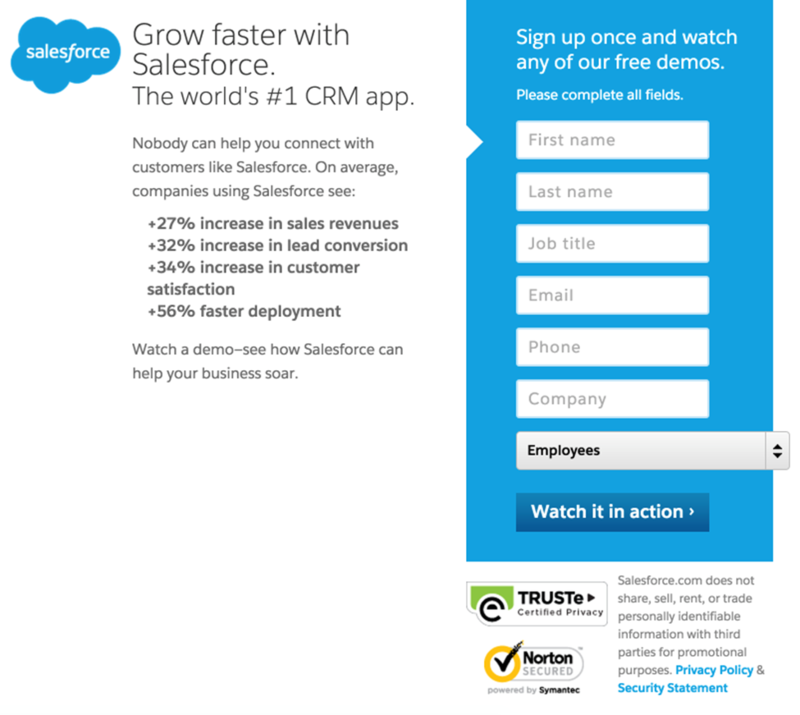 Here is Salesforce, a CRM SaaS. Conversion Action: Fill out the form and get a demo. Here is Starbucks. 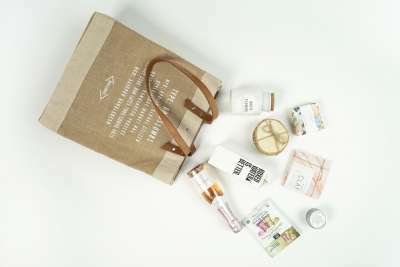 Conversion Action: “Explore” the variety of coffee subscriptions. Here is Sprint. 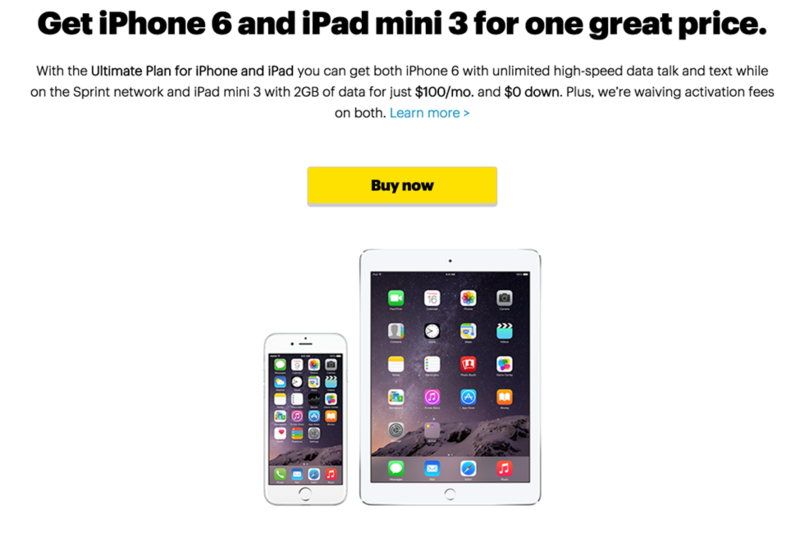 Conversion Action: Buy an iPhone 6, an iPad mini 3, and a subscription plan. How do you know what action to choose? The place to start is with your goals. What are you trying to accomplish? What is your goal? Know your customer. What would be best for them? Understand the customer’s journey. Where does this landing page meet them? Does it address their position? Know the position of the customer in the buy cycle. When and where are they most likely to make a purchase or decision? Once you analyze these factors, you’ll be able to successfully determine the best conversion action for your landing page. 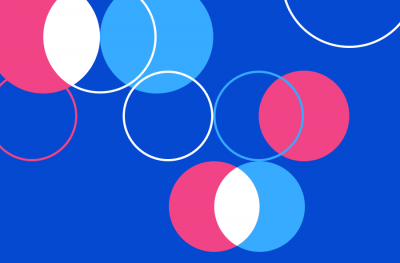 Cognitive flow is an often-overlooked feature in landing page creation. Cognitive flow is the way that a landing page addresses a user’s need, answers the user’s question, and leads them to the point of conversion. 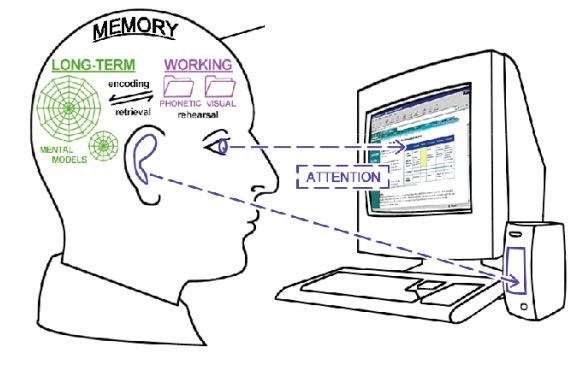 Cognitive flow is an application of the cognitive information processing (CIP) theory. According to the theory, learners are viewed as both seekers and processors of information. At the most fundamental level, a learner is absorbing phonetic and visual information, processing the information in both her long-term and working memory. Simultaneously, as the user looks at a landing page, he is following the train of thought in the content, asking questions, expecting answers, and raising objections, all in an unbroken flow of conscious processing. A landing page must successfully meet the user’s need for cognitive flow in the processing of information. Here are the questions or demands that a landing page will answer. Remember, a landing page can’t answer all these questions in a single glance. Thus, a landing page has a cognitive flow by which it addresses these issues sequentially and systematically. Here’s a landing page for Ramit Sethi’s online course “How to Talk to Anybody.” The CTA button is not in the screenshot below, but each element of the page helps the user flow cognitively through the process that climaxes in conversion. Notice how the following long-form landing page accomplishes a specific purpose at each section. Can I host it on my own server? Does it work for enterprise-level organizations? Does it work with JIRA, Slack, Hipchat? The landing page answers each question, coaxing the user towards a conversion using the power of cognitive flow. Within every landing page are elements of friction. Friction is another one of those cognitive issues that lies under the hood of most conversion optimization efforts. Applied to conversion optimization, friction is anything that gets in the way of a conversion. It could be a complicated process, a hard-to-find button, an unclear phrase, a slow-loading page or a weird font. The best conversion optimizers know that they must seek and destroy such friction. WiderFunnel’s LIFT Model of conversion optimization makes the attack on friction a major part of the process. Removing anxiety and distraction are two major methods of eliminating friction. Do I have any unnecessary form fields? Are there too many? These are just a sample of the many issues that could produce friction. The best way to identify friction is to get in the mind of your users (back to point number one). One of the main things that conversion optimizers do is test. Rather than rely on hunches and suspicions, they micro-analyze each element of a landing page in order to make the page as effective as possible. Although split testing is not without its pitfalls, it is the single best method of improving the conversion rate of a landing page or website. But what should you test? For any given landing page, there are thousands of things that could be tested. How do you select the elements of a landing page that will make the biggest impact? It will vary from landing page to landing page, and from industry to industry. That being said, there are a few things that most CROs tend to test right away. Here is a list of five things that you can immediately begin to test. Sometimes, the biggest conversion gains come from the biggest changes. Such is the case with a radical redesign. You may decide to radically redesign your landing page after reading this article. Such a change can reverse everything about an existing landing page. The color scheme is different, the form is different, the copy is different — everything can be different. Note: Some optimizers would not consider this to be a split test, because it is testing a huge variety of elements. For simplicity’s sake, I’m calling it a split test because it compares two versions of a page. Technically, however, the test involves more than two isolated elements. 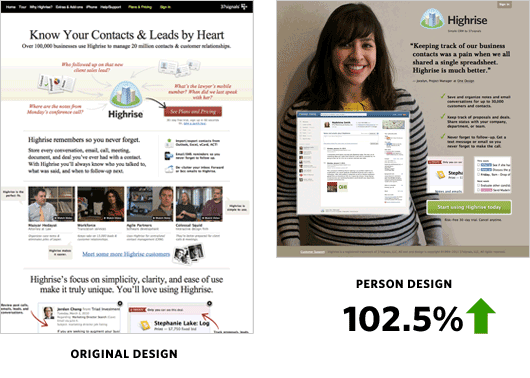 The newly redesign page — the long one — outperformed the original one by 30%. 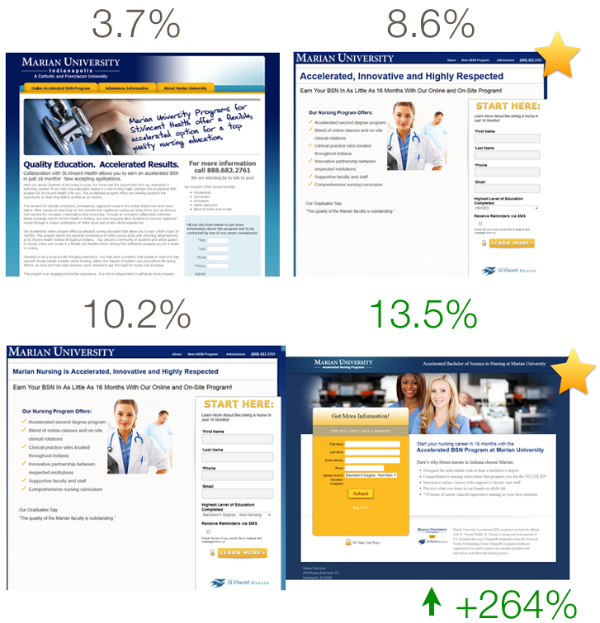 Marian University conducted a series of tests to see which of their landing pages performed better. The differences were pronounced. Images are a great source of testing fodder. One of the most basic tests is to compare an image landing page with a no-image landing page. You might be surprised by the results. For example, Hubspot tested two versions of a landing page to determine whether the image had greater conversion power or the no-image variation. As it turned out in the above test, Version A (no image) scored a 24% increase in submissions over the variable of Version B. You can also test the type of images. 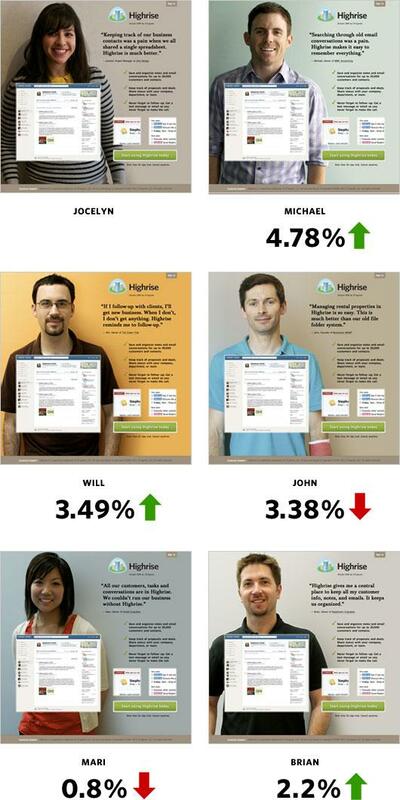 Highrise CRM tested the original design of their landing page against a simplified design with a picture of a user. The result was an increase in conversions of 102.5%. Not content with testing just a single picture, they produced six variations, and tested all of them. One of the most popular and effective split tests is headlines. A single headline tweak can produce surprising upticks in conversion rates. 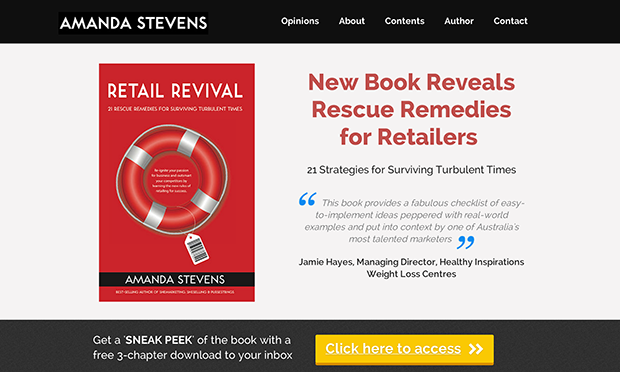 A LeadPages test compared two variations of a headline. 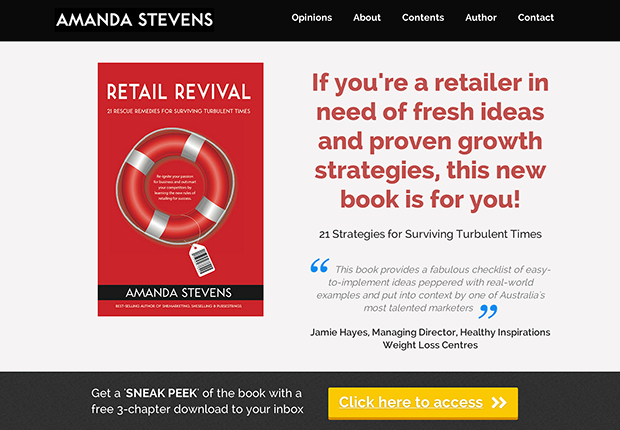 One was short, and aimed directly to attract the book’s target audience of retailers. The variation was longer, but spoke more directly to the user. The single test was profitable. It boosted conversions by 307%. Testing a headline is a fairly straightforward process. Buffer explains how they do it using Twitter traffic test cases. The tweetability of a headline can serve as an indication of its conversion success. We’re at the conclusion of the article, and I haven’t even told you how big to make your CTA button, or what size your image should be. What is your starting point for creating a conversion ready landing page?